Here's a big diary of what i was up to this week. Straight after arriving home from holiday last weekend, i had to go to Berlin, for work. There are much worse ways to start the workweek i tell you :). 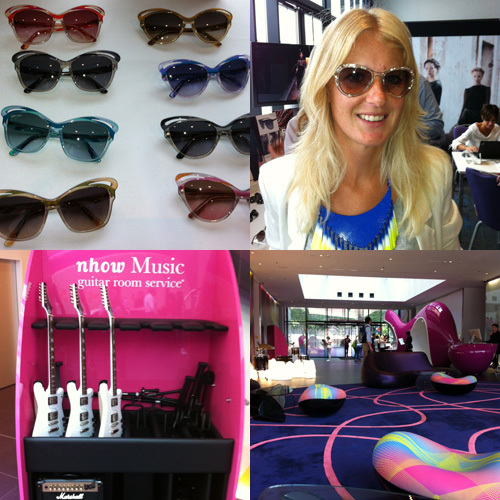 I was not there for the Bread&Butter fair unfortunately, but the aim was just as exiting: i got to see a preview of sunglasses collection 2013 :). 1. Collection of Emilio Pucci. 2. Amazing Valentino sunnies. 3. We were staying in the very cool Nhow Hotel, with guitars upon request via room service! 4. The colorful lobby of the hotel. 1. Spotted this striking jacket in a denim store in Berlin, when sneaking out on a small shopping trip in between meetings. 2. Sky-scraping dinner at the 20th floor for an amazing view on Berlin. 3. 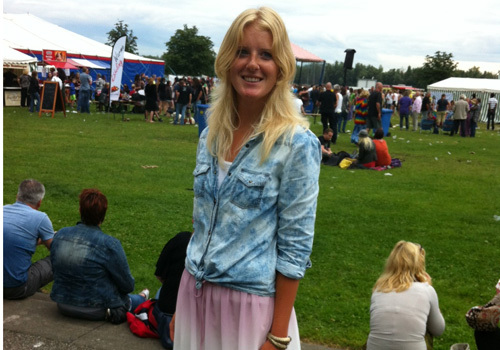 This weekend the hippie festival took place in my town. Music and pick nick, i like! Some visitors overnight at the festival ground, only allowed with a van :). 4. 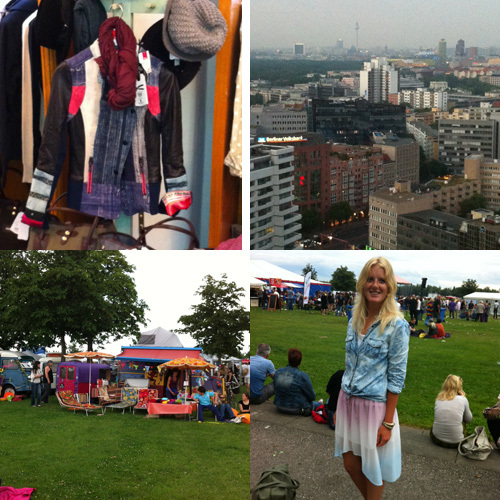 My Berlin shoppings! They made a perfect outfit for the festival. Shoppings: Mango blouse 22,90 and skirt 16,90 (both on sale hurray! Adjusted the budget with the spend amount). I have been looking for a denim blouse for a while now and i love the tie-dye effect on this one. The sturdy blouse makes a perfect match with the sugar sweet skirt i think! This definitely was a great week and weekend! What have you been up to?